For five consecutive years, Belgians have paid the highest amount of taxes in the European Union (EU). But after reducing the real tax rate last year, Belgium gave up the not-so coveted title to its neighbor. 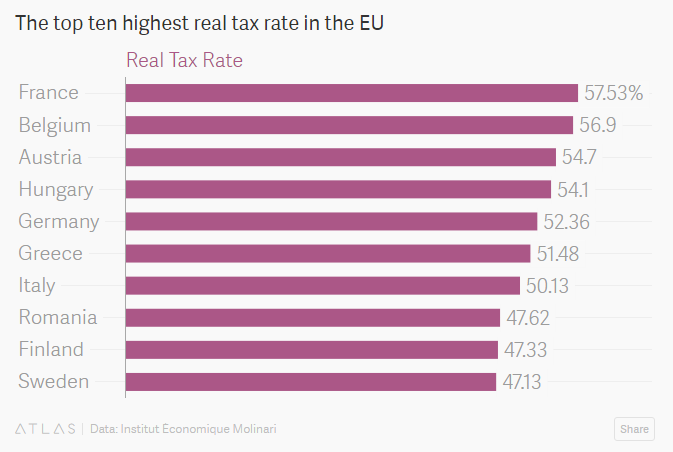 With a real tax rate of 57.53%, France topped the list in 2016. Belgium was second, and Austria came in third. Sweden rounded up the top ten with a real tax rate of 47.13%. Cyprus ranked at the bottom of the EU’s 28 member states, with a real tax rate of 23.85%—less than half of France’s. Workers in the 28 nations that are ( currently ) part of the EU saw their average real tax rate decrease slightly for the second time in the six years—from 45.19% to 44.96%. 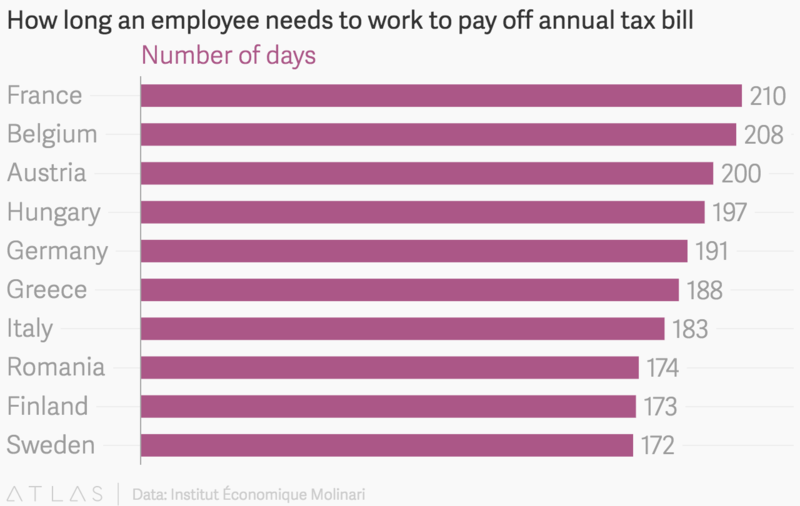 The average French earner has to work 210 days—until July 29—before they stop paying taxes to the government and start keeping their income. It’s known as the “tax liberation day,” which a recent study (pdf) by the Brussels-based Institut Économique Molinari uses to rank the tax burdens of individual employees earning typical salaries in the EU. Belgium’s tax liberation day is now nine days earlier (July 27), after the effective tax rate was reduced from 59.47% to 56.9%. But, the report notes that this tax deduction resulted in “little or no extra cash in typical workers’ pockets” as the government increased taxes on electricity, diesel fuel, and alcohol. Twenty of the 28 EU member states have raised VAT rates since 2009, according to the report. The largest increase was implemented in Hungary, where VAT jumped from 20% to 27%.